The modern theory of automorphic forms, embodied in what has come to be known as the Langlands program, is an extraordinary unifying force in mathematics. It proposes fundamental relations that tie arithmetic information from number theory and algebraic geometry with analytic information from harmonic analysis and group representations. These "reciprocity laws", conjectured by Langlands, are still largely unproved. However, their capacity to unite large areas of mathematics insures that they will be a central area of study for years to come. The goal of this volume is to provide an entry point into this exciting and challenging field. It is directed on the one hand at graduate students and professional mathematicians who would like to work in the area. The longer articles in particular represent an attempt to enable a reader to master some of the more difficult techniques. On the other hand, the book will also be useful to mathematicians who would like simply to understand something of the subject. They will be able to consult the expository portions of the various articles. 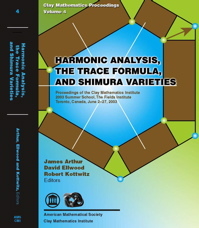 The volume is centered around the trace formula and Shimura varieties. These areas are at the heart of the subject, but they have been especially difficult to learn because of a lack of expository material. The volume aims to rectify the problem. It is based on the courses given at the 2003 Clay Mathematics Institute Summer School. However, many of the articles have been expanded into comprehensive introductions, either to the trace formula or the theory of Shimura varieties, or to some aspect of the interplay and application of the two areas.